Triple Eight boss Roland Dane will be absent from Sydney Motorsport Park this morning after dashing back to Brisbane for an important ceremony. 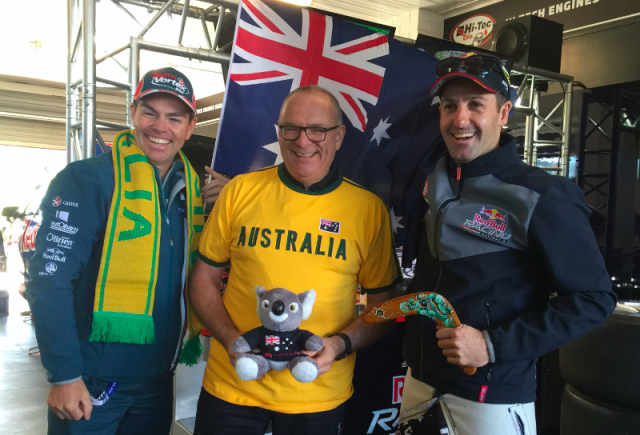 Thirteen years after moving to Australia to set up Triple Eight’s Supercars operation, the Irishman will be confirmed as an Australian citizen. Dane says that becoming a citizen is a nod to his family’s heritage and provides an example for his Australian-based daughter, Jessica, to follow in future. “I’ve thought about it in the past and beginning this year I thought I should definitely do it,” Dane told Speedcafe.com. “I wanted to close a circle for myself where my grandfather was born here in Adelaide in 1892 and was an Australian. “Also I wanted to set the scene for Jessica to do the same when she is eligible at the beginning of next year. “She has embraced Australia and I want her to keep her options open for the future, especially when I see the state of the world and Europe and what’s going on there. Dane’s efforts in Australia have yielded one of the country’s greatest motorsport powerhouses. Since 2008, Triple Eight has won six Supercars drivers’ championships, seven teams’ championships and six Bathurst 1000s. Expanding to three cars over the 2015/16 off-season, the team looks set to add to its tally this year with drivers Jamie Whincup, Shane van Gisbergen and Craig Lowndes currently sitting first, second and fourth in the standings respectively. Triple Eight recently reached another major milestone with the announcement that it will be Holden’s sole factory team from 2017, taking over the Holden Racing Team banner and undertaking the development of the next-generation Commodore for the following season. Dane has spoken openly over the last year about succession planning for his business, bringing in minor equity partners Paul Dumbrell and Tim Miles last year. Although still with strong family and business ties in the United Kingdom, including his high end vehicle trading firm that is 30 years old this year, Dane envisages remaining domiciled in Australia for good. “I’d never say never with anything in life, but I don’t see myself going anywhere else,” he said. “I enjoy going back to England and to Ireland on a relatively regular basis to see everyone and catch up. “I’ve still got a family house in Ireland. I’ve still got a business in England and a daughter in England as well. “Making the move when I did was something that I wanted to try given the family history and the opportunity with V8 Supercars at the time.